Size: 1500mm x 1000mm – (12 or 25mm thick) Other thicknesses available for larger orders. Sound absorbing acoustic foam designed to reduce reverberation and airborne noise. Ideal for lining the inside of enclosures to reduce noise from small plant and machinery. Effective airborne absorption for machinery covers and enclosures. Easy to cut with a knife. Self-adhesive option available or stick with our special spray adhesive. Available 12mm or 25mm thick. Sound absorbing acoustic foam is designed to control airborne noise by reducing the reflection of sound from boundary surfaces thus reducing the overall noise levels. This is an essential acoustic insulation to help comply with the Control of Noise at Work Regulations. Applications for acoustic foam is found in a wide variety of noise control treatments such as machinery enclosures, plant machinery and cabs, office equipment and domestic appliances. Acoustic foam is normally employed as an internal lining to machinery guards or enclosures. 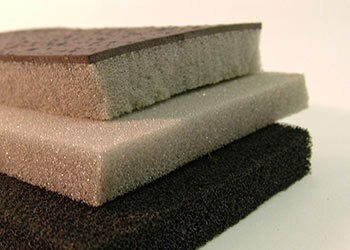 Acoustic foam is also available with a tough polyurethane film face to protect from dust and fluid contaminants. Please call 0845 363 7131 to enquire. The absorption element of acoustic foam is provided by a special grade of polyurethane foam produced to an exacting structural specification for maximum sound absorption. Click HERE for our non-flammable version of acoustic foam. Supplied plain or with a self-adhesive backing. Please note normal acoustic foam is not fireproof but does meet the flame resistant requirements for installation into motor vehicles and boats. If a non-flammable version of acoustic foam is required, use the FR class 0 type.